We’re already expecting Apple to introduce a new MacBook Pro that includes an OLED touch bar with customizable function keys, and now it seems that the company could be looking to take that customization across to a new Magic Keyboard as well. 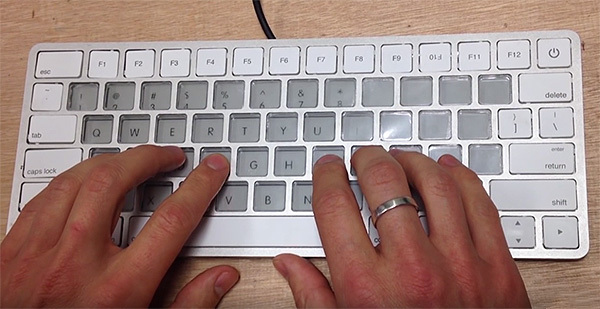 A mysterious source has provided information claiming that Apple is working on second-generation Magic Keyboard that includes customizable E-Ink display keys. The source is claiming to have information pertaining not only to Apple’s new MacBook keyboard module, but also a 2018 E-Ink Magic Keyboard, thanks to a Foxconn event that was held at the Tsinghua University campus. We’ve already been privy to a number of rumors pertaining to the new OLED module within Apple’s speculated MacBook, but this is one of the first times that we’ve actually heard about this new E-Ink Magic Keyboard, with the source suggesting that the hardware seen was a Design-For-Testing (DFT) model, or one that’s currently in the design for testing stage of development. Foxconn hosted the demo day on campus at their Innoconn Incubator with startups they have invested in. It is the same science park as Apple’s new 300m R&D center. They had an Australian startup which I recognized from a Wired Germany magazine from last year. The startup Sonder makes a smart keyboard module, it has a new magnetic mechanical mechanism and a lit E-Ink display which allows for swapping shortcuts and languages etc. I saw it swap between a few programs and languages (English, Japanese, Taiwanese layouts etc). In addition to this leak of information, a Foxconn executive has also stipulated that Apple is actually close to finalizing an acquisition for Sonder, the company mentioned by the source in the snippet above. Lucky for us, the source has pointed us to a video (embedded below) that Sonder shared with him teasing what the new keyboard could look like in action. From the MacBook perspective, we’re actually expecting Apple to make an announcement sooner rather than later, which could potentially give us a detailed insight into this new Magic Keyboard technology. As always, we’ll keep you updated as and when this develops further. Stay tuned. There are more computer users are like this magic keyboard and they find more comfy to use this device. So i hope it will be so popular around the world.